Have problems swallowing large pills? Amazon has got these 60-count YumVs Vitamin C jellies with Echinacea and Rose Hips for $9.50 - $4.00 = $5.50. These vitamin jellies are OU-pareve kosher and contain 120 mg of Vitamin per serving (2 jellies). 4.8 out of 5 stars over 3 customer reviews. 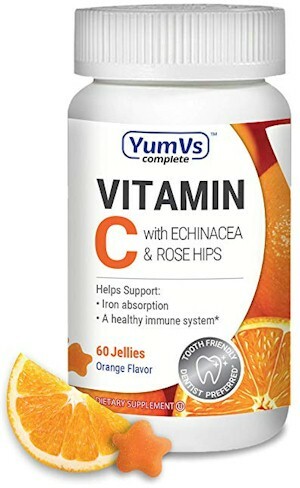 YUM-V's Complete Vitamin C Jellies with Echinacea and Rose hip extract, Orange Flavor (60 count). Tooth-friendly pectin jelly bears contain 400% of the daily requirement of Vitamin C with echinacea and rose hip extract for added immune support. Dietary Supplement: Vitamin C helps the body absorb iron and is essential for immune health. Each serving of YUM-V's Complete daily supplements contains 400% of the recommended daily allowance of Vitamin C.
Features: We believe in using high-quality, natural ingredients for all of our products, and maintain a nut-free production facility. Formula is vegan, non-GMO, gluten-free, gelatin free, and contains no artificial colors, flavors or preservatives. Kosher/Halal. Flavor: Mouthwatering and delicious, fruit flavored, chewable jellies packed with nutritional value. Yum-Vs Complete jellies are an excellent way for kids to get their daily supplements in an easy and tasty manner. Recommended Use: Our top-rated yummy gummy-like jellies are the very best way to incorporate vitamins into our kids' diets. Designed for children of all ages, from toddler to teen. Give a single treat to your kids every day to support their health in a fun and yummy way.